Our children attend Live Oak Elementary School, Castaic Middle School, and the West Ranch High School. If you see gophers on HOA property please call Crown Management immediately. The HOA contracts with the County of LA to control the gophers that are on HOA property. The county and the HOA cannot go onto your property to control the gophers. The homeowner has to contract with a local pest control company. Los Angeles County Ordinance 20.72.110 governs the time and placement of trash containers. Hours for placement : "No person shall place any solid waste or any container containing solid waste, at any place of collection before 5:00 p.m. of the day preceding the scheduled collection of said solid waste, or leave any such container at the place of collection after 8:00 p.m. on the day of actual collection, or more than two hours after actual collection whichever is later"
To avoid citation by the Department of Public Health remove the carts no later than 8 p.m. on the day of collection. remainder of the week will be delayed by one day. 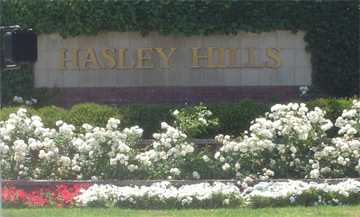 Copyright © 2004-2019 Hasley Hills Home Owners Association. All rights reserved.